Our experience of setting up Moodle as an administrator, for a couple of sample courses of different kinds (weekly, topic based and social format) and by adding in the SLoodle module both in the web end of Moodle and in Second Life classroom has been a frustrating experience. This is a mostly due to the very many layers of user permissions, user roles, different styles of setup, confusion over what happens at site, user and course levels, and interactions between these, and so on. We still cannot work out why some users can see their SLoodle profiles and others cannot even with all permissions ticked on (more than should be needed). To provide a clear gateway where people can enter, or request entry. 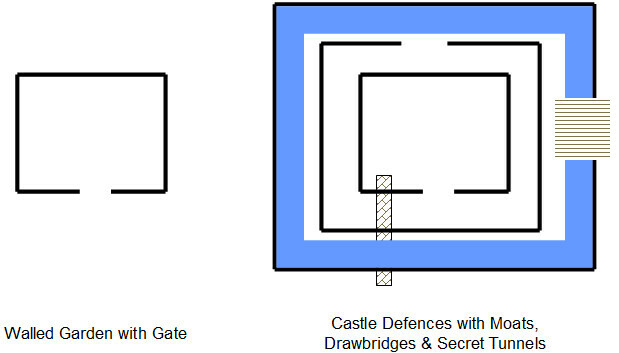 But my mental picture of Moodle is more like a complex arrangement of “Castle Defences” with multiple battlements, with entry points offset from one another and the direction to turn not obvious at every level. There are moats and some bridges across. But you are not sure where they all are. There may even be secret tunnels you don’t know about and that others may be able to use, and you suspect there are as its all so labyrinthine. This entry was posted in IDEL11, Moodle, Second Life, SLoodle, VLE and tagged Moodle. Bookmark the permalink.